In my twenties, when I spent a lot of time in Oregon and the southwest, I came to love country music. I enjoyed the roots of the genre as you hear it in artists like Hank Williams, Bill Monroe, and The Carter Family. I also favored contemporaries of the time like Emmy Lou Harris and Johnny Cash. I haven’t listened so much since the genre tilted toward glamour and glitz. That’s one reason I was delighted to hear a fresh young artist introduced on NPR. Twenty-four year old Kacey Musgraves writes and sings with the heart and authenticity of her country ancestors, even as her songs are squarely 21st century. Her debut album, “Same Trailer, Different Park,” comes out on March 19. 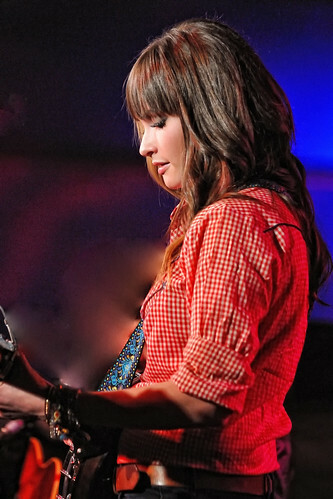 You can sample the songs on the NPR page, First listen: Kacey Musgraves. Yeah ain’t we always looking For a bluer sky? I’m planning to visit iTunes for this on March 19. This entry was posted in Music and tagged Country music, Kacey Musgraves, Music, Same Trailer Different Park. Bookmark the permalink. Thanks for the post. I’d never heard of Kacey Musgraves. Nice voice and not TOO country. I’m not crazy for country, but I like stuff like this. I was playing it and my husband asked if it was our daughter Maggie singing. I don’t think they sound that much alike, but you can judge for yourself.